New Delhi/Beijing: Abhinav Bindra won India’s first ever individual Olympic gold medal on Monday with a come-from-behind victory in the men’s 10m air rifle, but sports agents are divided on whether this will translate into lucrative brand endorsements in a country where cricket and movie stars remain favourites with advertisers and audiences. And Anirban Das Blah, vice-president at celebrity management firm Globosport, said Bindra could expect to make between Rs1 crore and Rs1.5 crore on each endorsement deal, though “the figure is likely to come down after six months". Not everyone is convinced that will happen. “These kind of sports, such as shooting, do not have the mass appeal and will not get any support from companies," said Lokesh Sharma, managing director of 21st Century Media, a sports management and syndication firm. Sharma said comparing Bindra’s achievement with that of other sportsmen in more popular and lucrative games was “like comparing a great art film with a commercial blockbuster". On Monday, Bindra’s victory was straight out of the plot of such a blockbuster. He was fourth after qualifying, but had a brilliant final round and hit a near perfect 10.8 on his last shot to pull in front of Henri Hakkinen of Finland, who fell to bronze with a poor final shot. That late stumble by the Finn allowed China’s Zhu Qinan, the defending Olympic champion and heavy favourite, to salvage a bitter day with silver. Zhu sobbed uncontrollably on the podium and again at a news conference. Bindra, in contrast, was the picture of composure. “I can’t describe how happy I am," the ever-calm Bindra, 25, told journalists. “It’s the thrill of my life. That’s about it. It’s hard to describe. I just went for it. I knew I was lying in fourth. Thankfully it went my way and I just went for it." Bindra, who faced criticism for failing to deliver on the great promise he showed as a child, said he was not thinking about making history in India with a first individual gold medal. In fact, he said, he was “not thinking about anything". “I was just trying to concentrate on shooting," he said. “I wasn’t thinking of making history...."
His 10.8 of a possible 10.9 on his final shot sparked loud celebrations from the group of fans from India. Bindra’s agent Khaneja said the shooter was already backed by Samsung Electronics India Ltd, the local arm of the Korean electronics firm and Sahara group, and that it would eventually be his decision whether to endorse “any product or not". “He is a very private person." Samsung Electronics’ deputy managing director Ravinder Zutshi said his company was committed to the Olympics and would use Bindra to “spearhead" its future Olympic campaigns. He added that it was “premature to talk about" using the shooter as a brand ambassador. Bindra is already a so-called Samsung Olympic Ratna, one of the six Indian athletes supported financially by the electronics firm since 2007 in their quest for an Olympic medal. Blah said Bindra would likely have “at least two offers by the end of this week, before he even comes back from China. But the challenge for him would be to maintain a strong brand value and ensure visibility for the next three-four years, till the next Olympics". On Monday, three Indian states, including Punjab, Bindra’s home state, announced cash awards totalling Rs1.15 crore for the shooter, low-cost airline SpiceJet said it would allow him “unlimited free personal travel for life" and rail minister Lalu Prasad announced a gold pass which will allow him and a companion ride the railways (in first class, air-conditioned compartments) free for the rest of his life. “He’s done the country proud; he’s done us proud; and himself proud," Bindra’s mother Babli told CNN-IBN news channel, and added that the shooter was now probably the country’s most eligible bachelor. 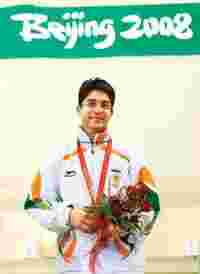 Bindra won the 2006 world championships and finished seventh in Athens four years ago. At Athens, Indian trap shooter Rajyavardhan Singh Rathore won a silver medal. A year later he signed on with Khaneja’s Collage (the relationship ended in 2006) and endorsed Sahara, Hero Honda, and Coca-Cola. An army officer, he needed special permission from the army chief to take on these endorsement assignments. Bindra, based in Chandigarh, runs a computer peripherals business. Erik Kirschbaum is with Reuters. Lee Chyen Yee of Reuters and Gavin Rabinowitz of AP contributed to this story.